These days, Hunter collects watches—and most of them are G-SHOCKS. 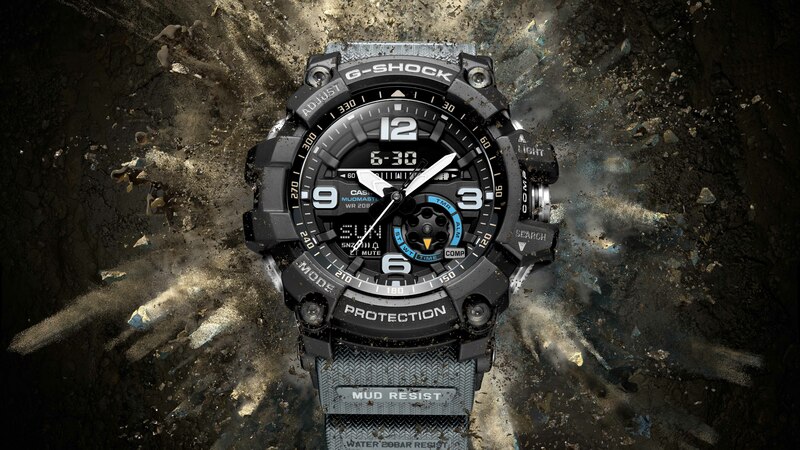 On his wrist he wears the G-SHOCK MUDMASTER GG1000-1A8. “It’s the most macho watch out there. I’m constantly lifting barbells, I’m in the woods, I’m splashing through mud, digging holes, dragging sleds in the dirt. Then in the afternoon, I go surfing.” The MUDMASTER’s trademark Mud Resist construction ensures that Hunter’s watch is with him always, providing vital time, bearing and temperature readings. Hunter, AKA “The Sheriff,” never expected to be competing against the world’s greatest athletes. He floated through his youth—lumberjacking in Montana, working as a male model, partying a lot. Then, in 2012, he and a group of friends signed up for a Spartan Race on a lark. Hunter was the only member of his group to finish. Seven years later, Hunter has turned his body into a massive, streamlined catamaran, smashing through courses and leaving stupefied opponents in his wake—and Hunter’s G-SHOCK is with him every step of the way, from gym to jungle. Since that first Spartan Race, this former party animal has transformed himself into a fitness machine. He eats 6,000 calories, daily, and wakes at five a.m. He works out two, sometimes three times a day. And he wins. A lot. But the competition grows fiercer by the month, and that means Hunter must constantly be improving. That’s where the MUDMASTER comes in. Hunter doesn’t have time to worry about whether his watch will survive his grueling workouts. “I need something reliable,” he insists, indicating the watch on his wrist. The MUDMASTER forms the ultimate connection between technology and Hunter’s outdoor lifestyle. The G-SHOCK’s twin sensors—digital compass and thermometer—help him to prepare for any challenge, and the MUDMASTER’s mud-resistant technology ensure that nothing gets into Hunter’s watch—even during the nastiest Spartan or Tough Mudder race. The MUDMASTER also employs multiple gaskets on the pipes that guide the watch’s buttons and shafts—a revolutionary design that helps keep mud out. These pipes act to protect buttons from impact, while ensuring that the buttons still function under the toughest of conditions, and the Twin Sensor capabilities provide instant access to direction and temperature information, even when you’re deep in the dirt. And, like any G-SHOCK watch, the MUDMASTER is ideal for remembering data. “I keep track of everything,” says Hunter. “I mean, I time everything. My life is run by a stopwatch.” The G-SHOCK’s 1/100th stopwatch and countdown timer make life easier for Hunter—not to mention the round timer and the five-daily-alarm capability.